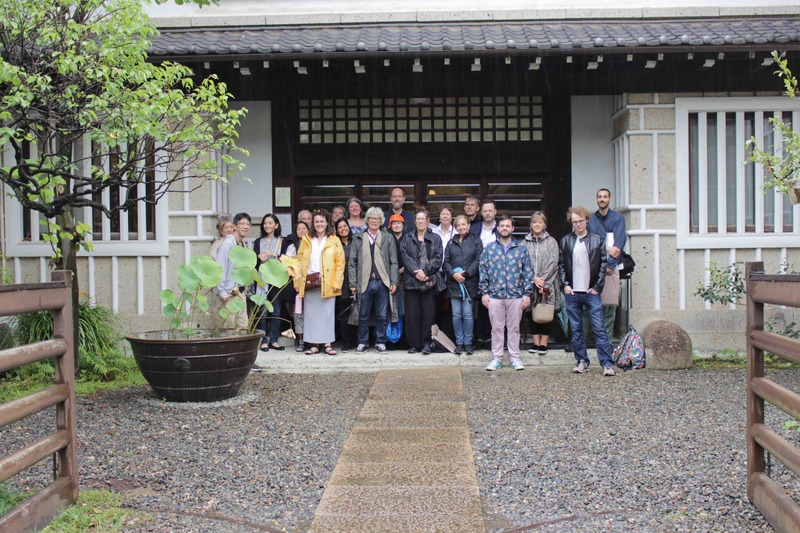 In September 12 students from Clay College went on an immersive trip to Japan. 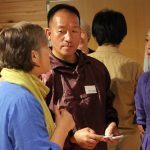 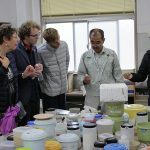 This was to augment their understanding of Japanese ceramic techniques and inform their future practice. 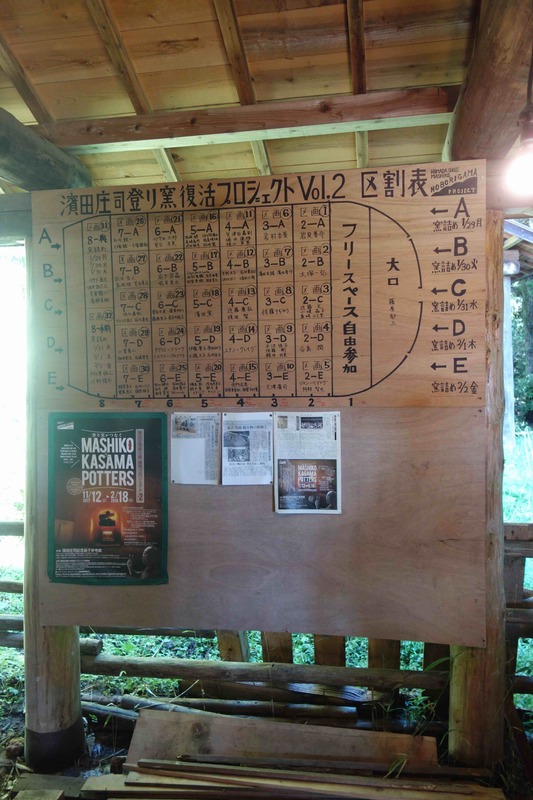 The visit also enabled a long term link between the College and potters in Japan, specifically Mashiko to develop. 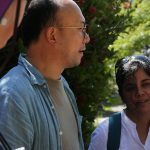 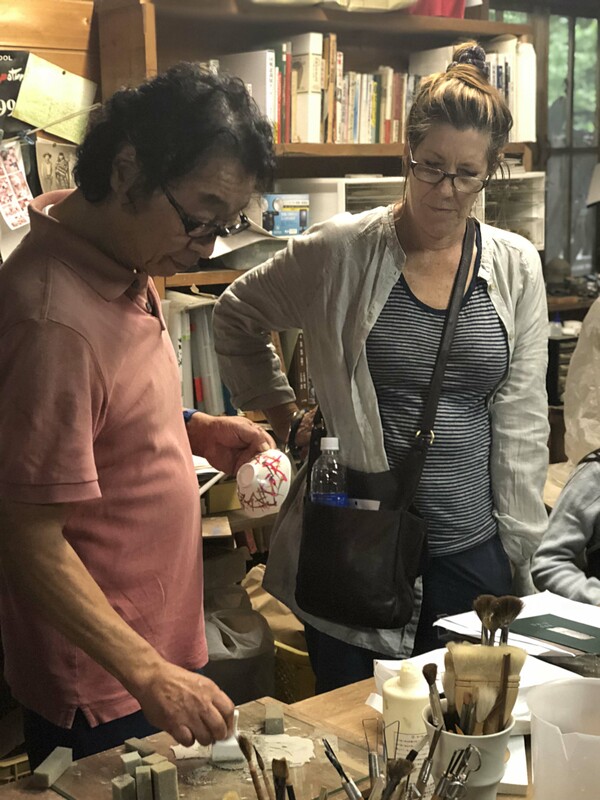 24th September – After a long flight from Manchester the students and staff to be met by the trustees of Adopt a Potter and Ken Matsuzaki. 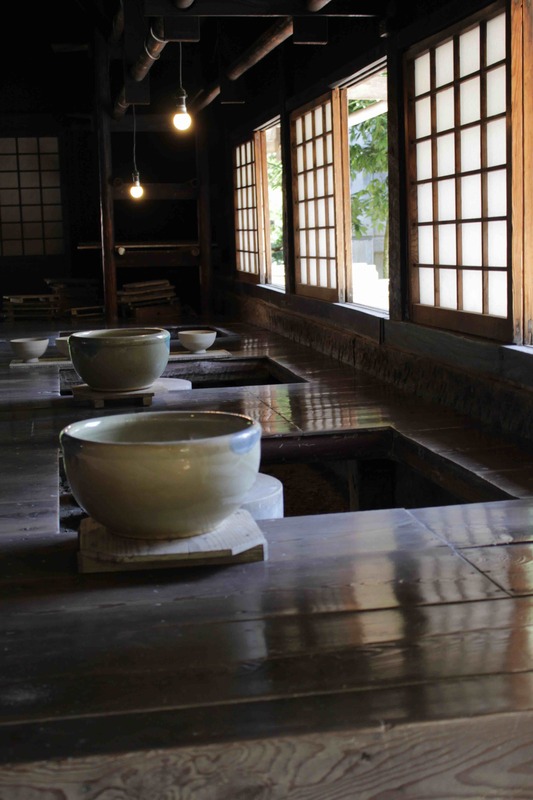 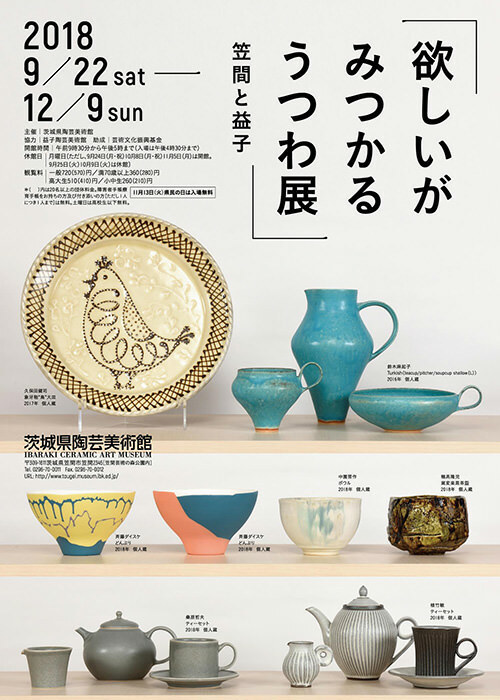 Ken had arranged for everyone to be transported to Mashiko via Ibaraki Ceramic Art Museum. 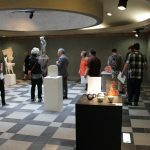 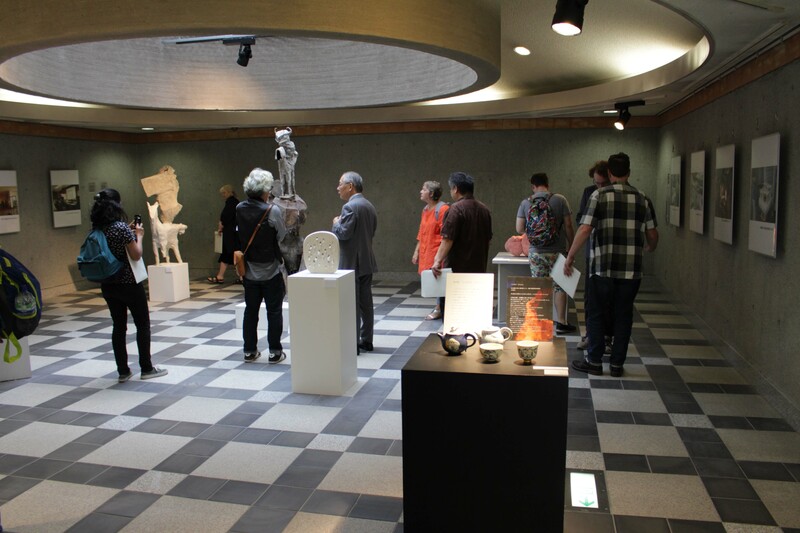 Here the students got to see the collection – Great Masters of Modern and Contemporary Japanese Ceramic Art along with Utsuwa Exhibition – Kasama and Mashiko in the special exhibition area. 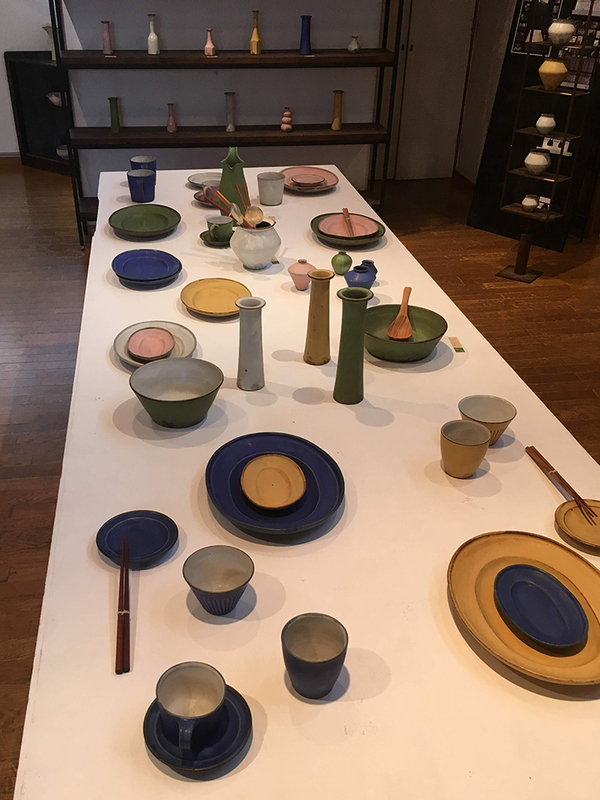 This was a perfect introduction to Japan and the exhibition was of great interest as it featured a number of different potters the students were going to meet during their time in Mashiko and Kasama. 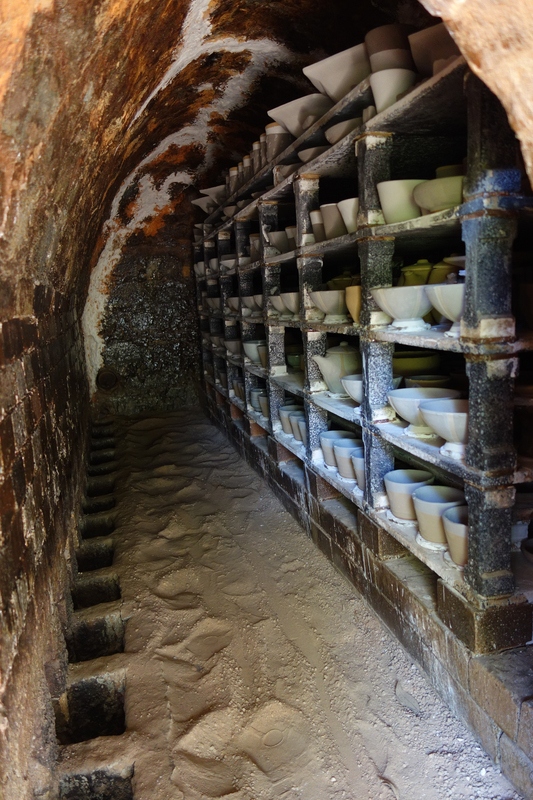 It also reflected the changing nature of ceramics in the area. 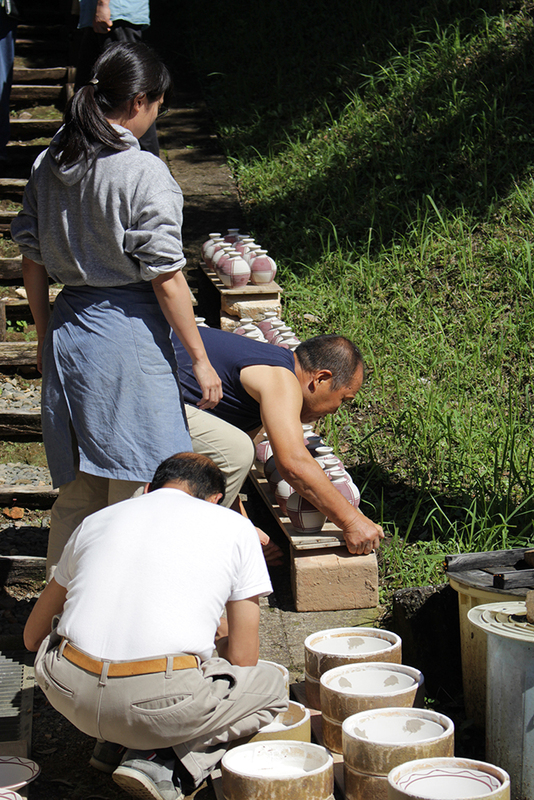 25th September – This focused on understanding ceramics in Kasama which has a broader tradition than many other areas. 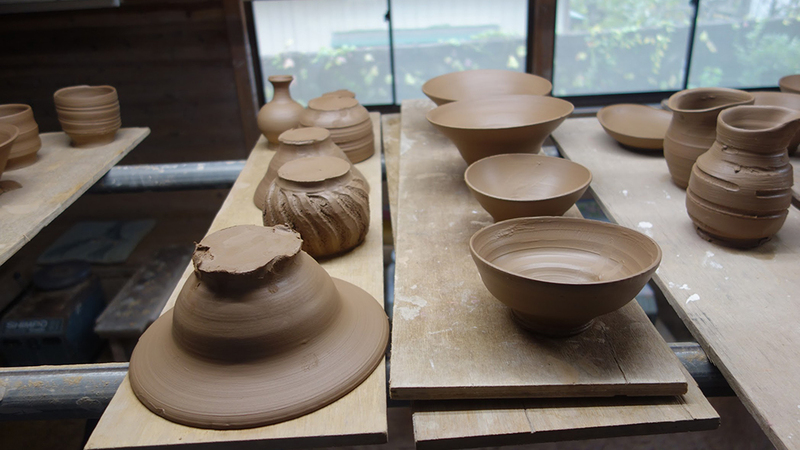 This started with a visit to Ibaraki Prefectural Kasama College of Ceramic Art. 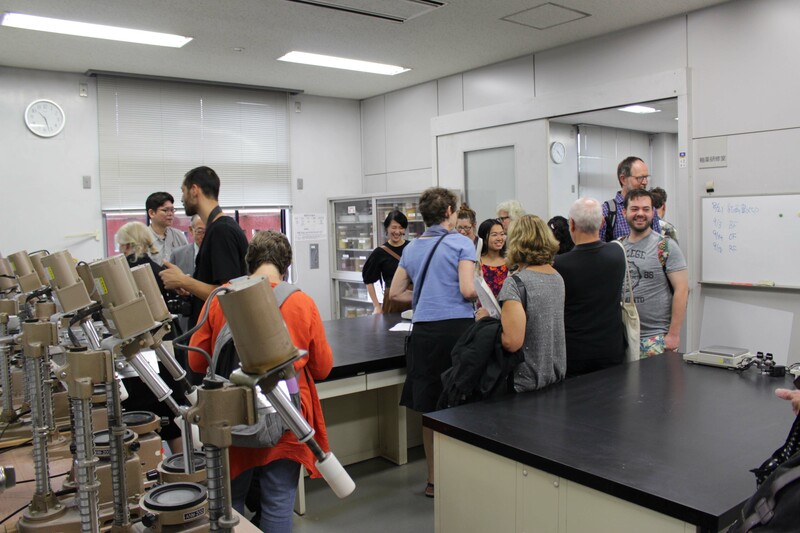 The group was met by the Director of the College and all the key lectures along with many of the students. 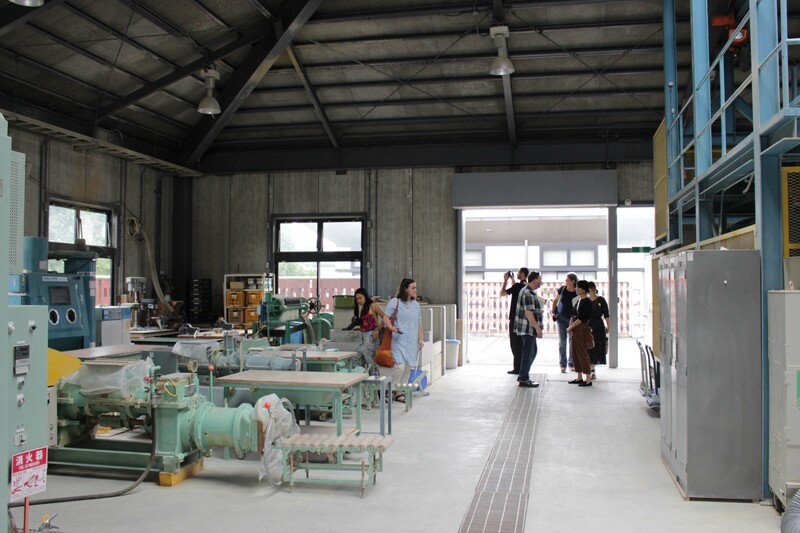 This was an opportunity to begin to develop links and tour the considerable facilities of the college. 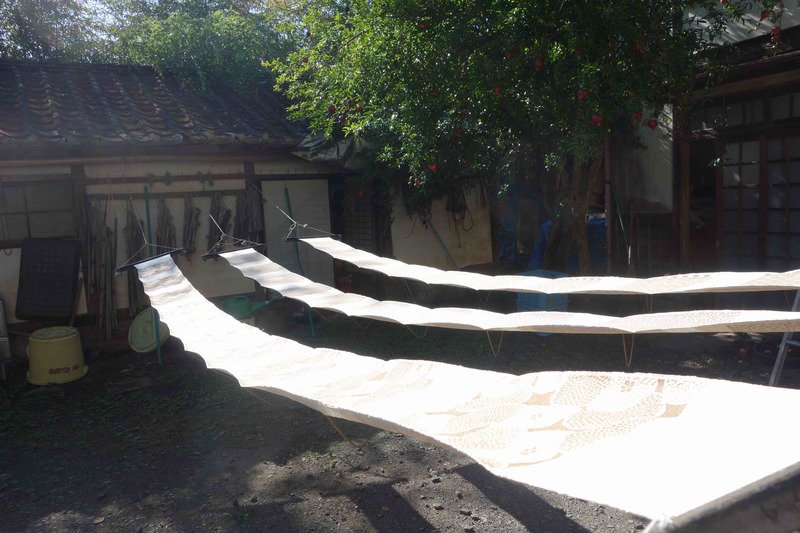 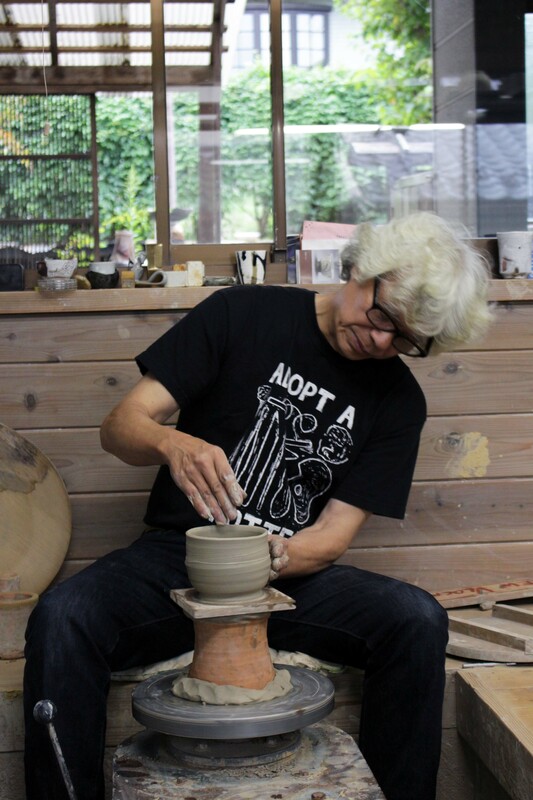 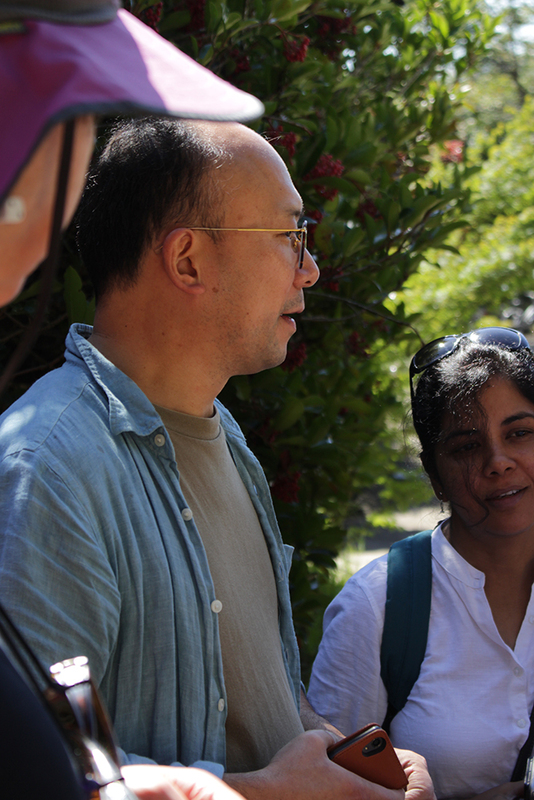 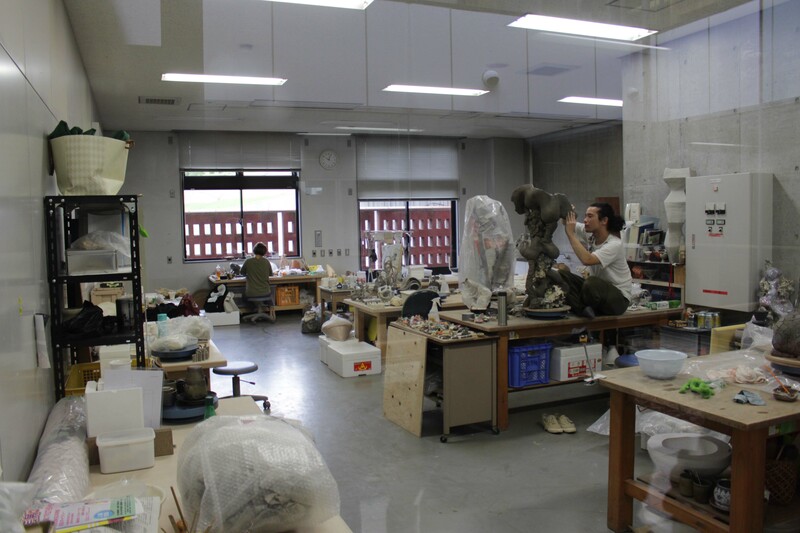 The second stop around Kasama, was a visit to the studio of Mamoru Teramoto. 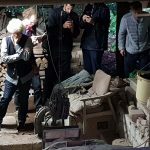 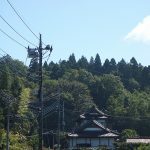 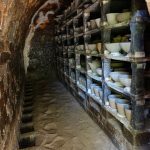 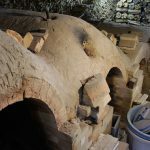 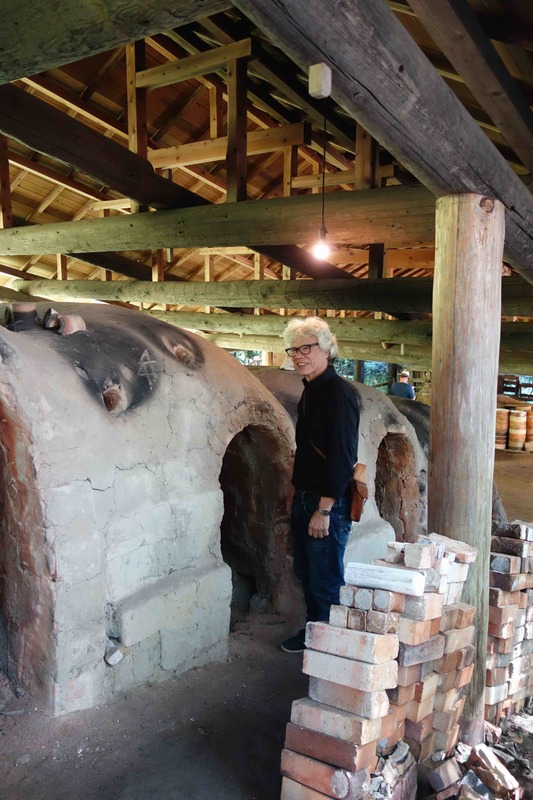 Students were treated to see his noborigama and anagama climbing kilns along with his hidden kiln which is a smaller kiln that tracks up the slope alongside the other kilns but is smaller with a greater draw from the chimney. 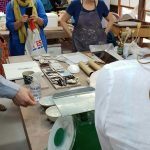 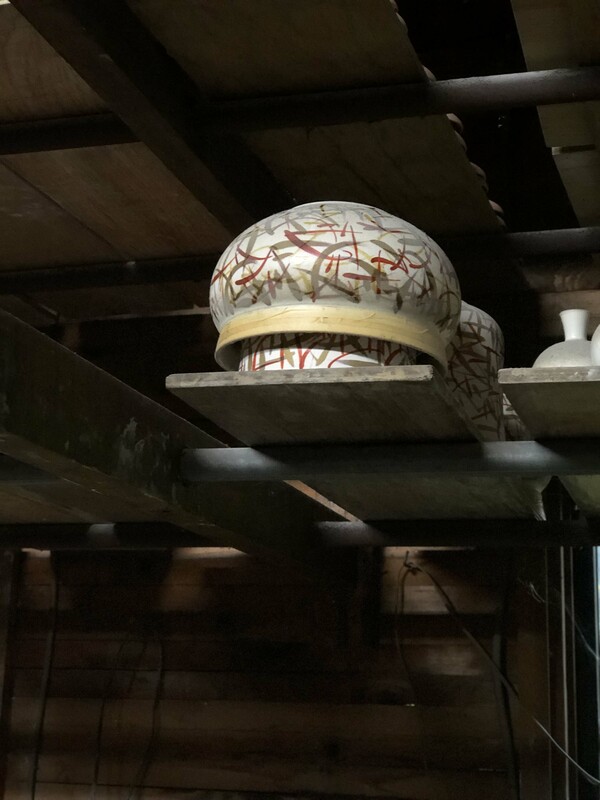 After a full tour of his studio he demonstrated some of the different decoration techniques he uses including silver overglaze decoration. 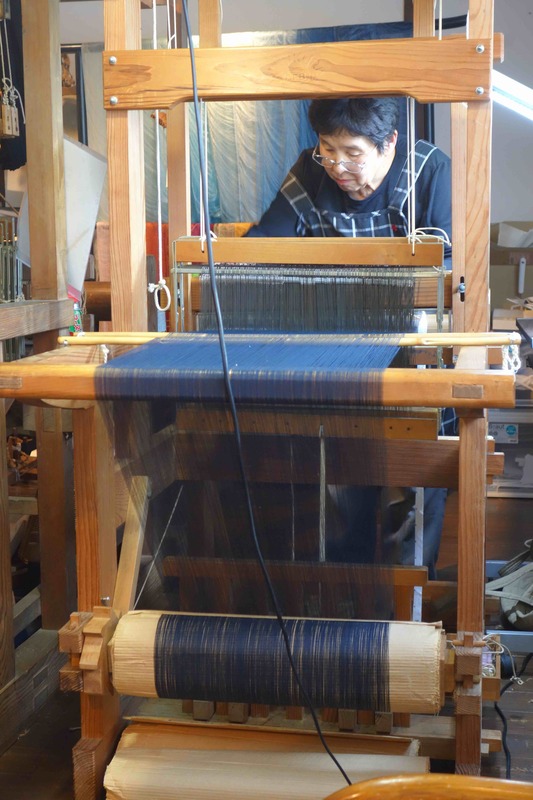 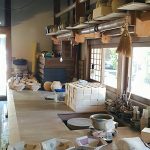 The third stop was to the studio of Akio Nukaga. 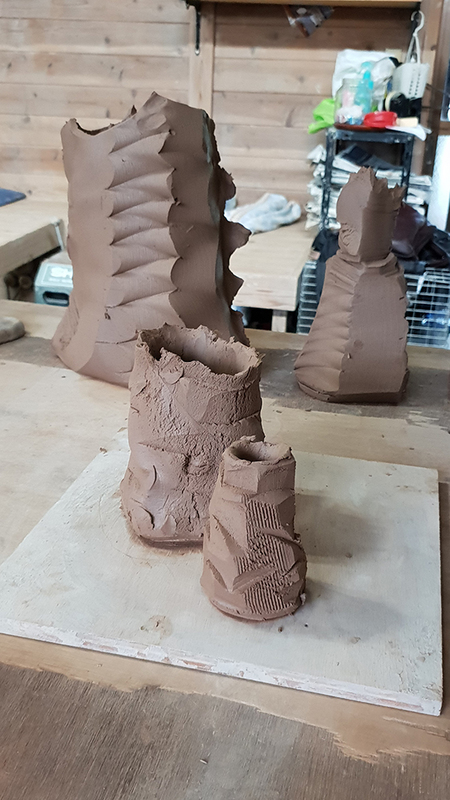 In the studio there was an opportunity to study his work in all stages including looking at his use of lines through fluting, his use of hump moulds, alongwith slips and glazing techniques. 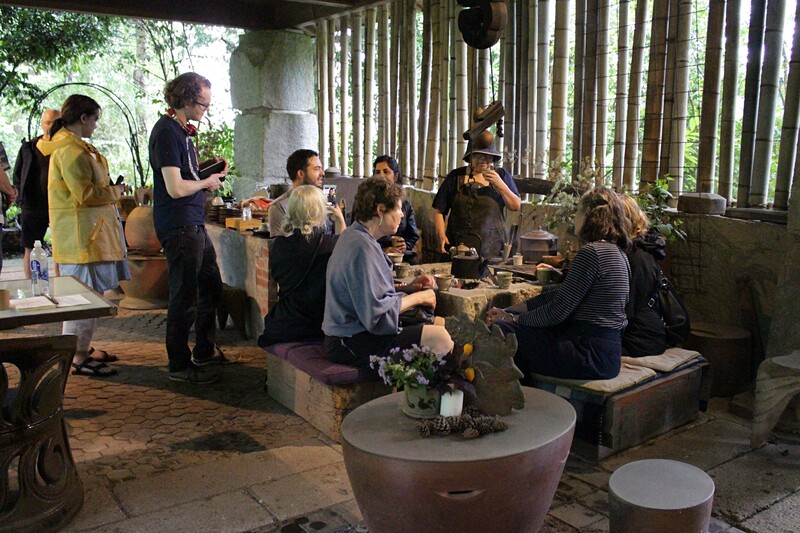 The final stop for the day was the idyllic woodland studio of Toyo Kobayashi. 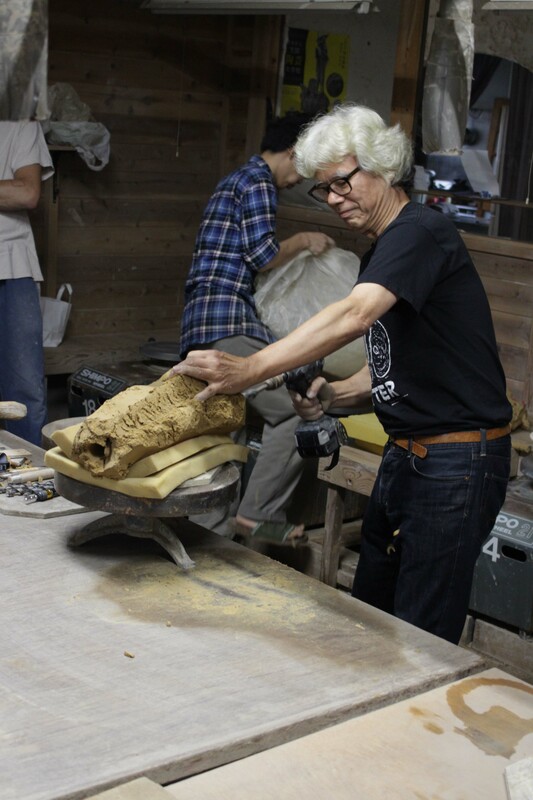 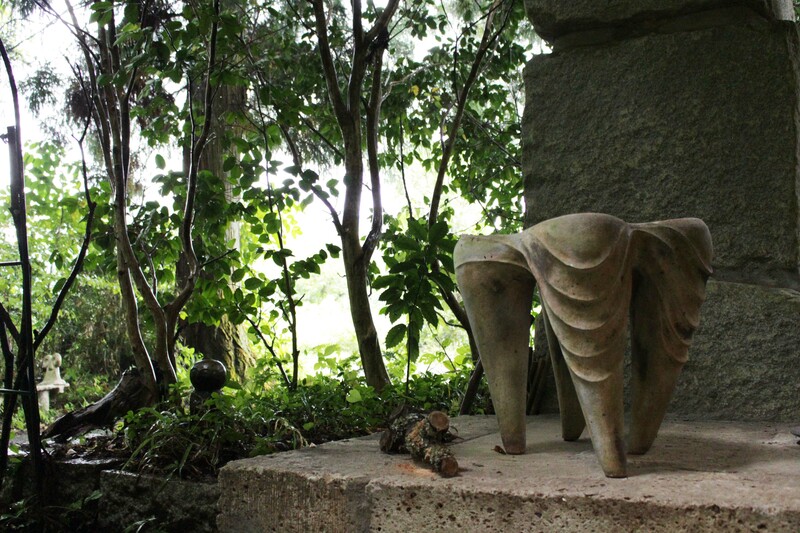 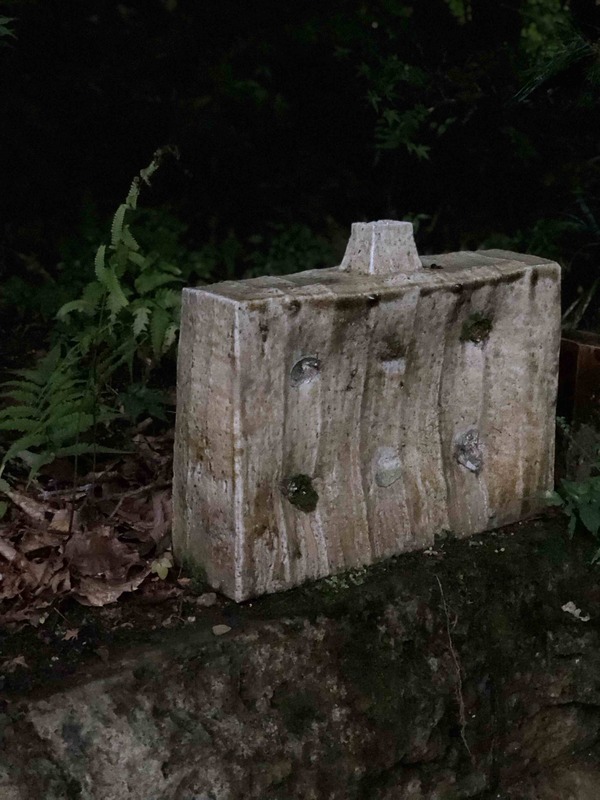 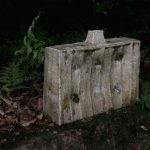 Kobayashi is known for his sculptural ceramic furniture that is fired in his anagama. 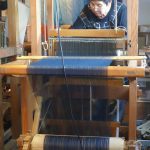 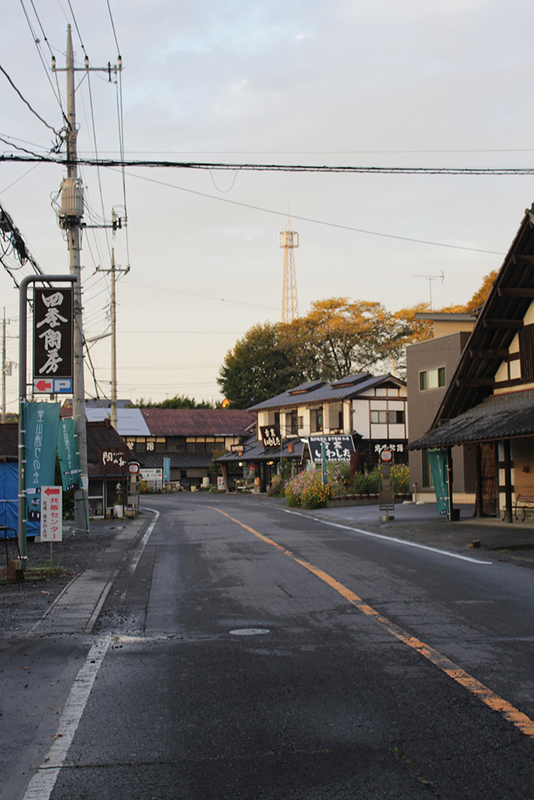 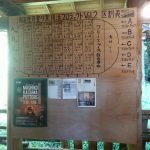 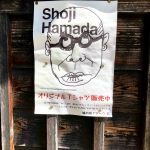 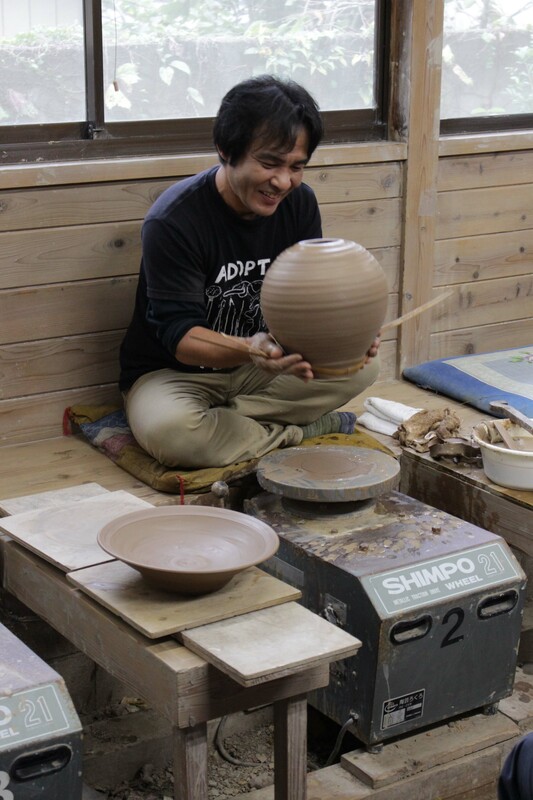 Since 2011 he has been repairing his anagama that was damaged during the earthquake. 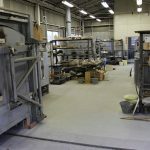 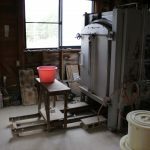 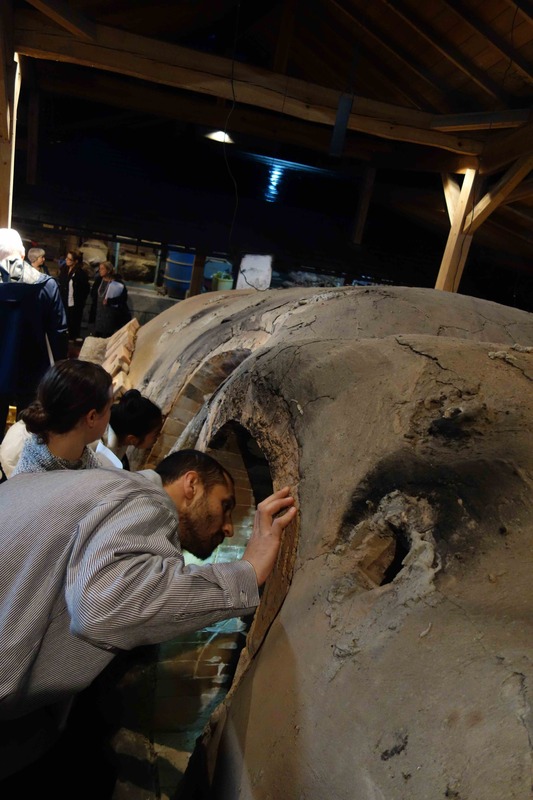 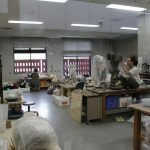 It was amazing to see where such large pieces are fired, also the hoists and equipment that are needed in the studio to work with that quantities of clay for building furniture. 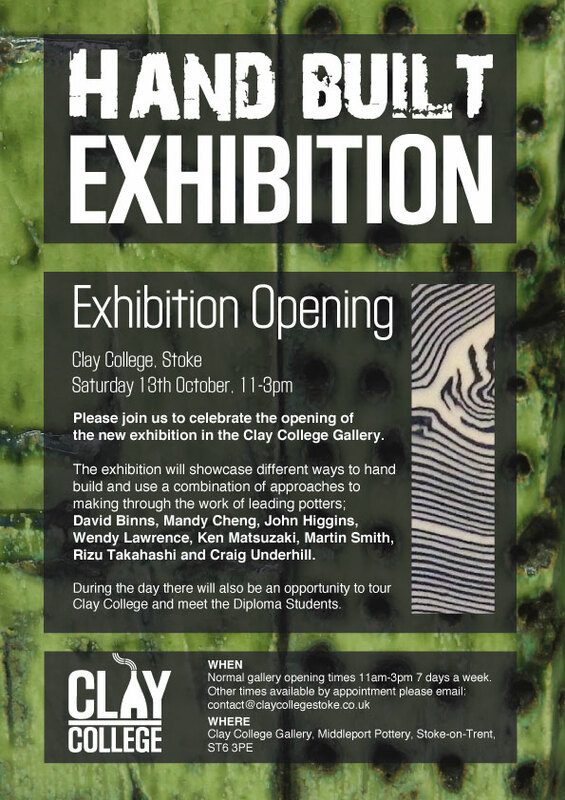 26th September – Mashiko gave Clay College the most fabulous welcome to their town. 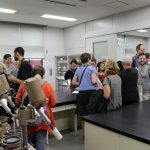 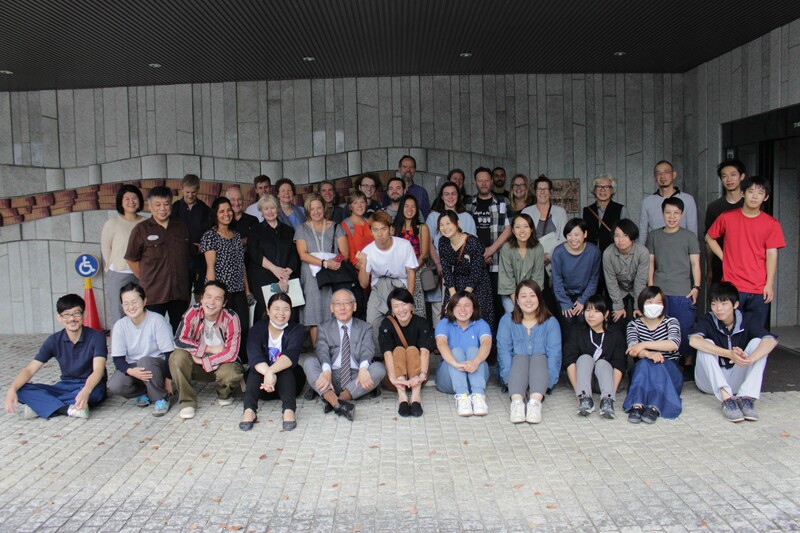 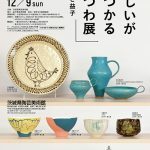 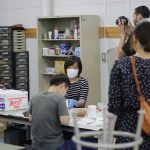 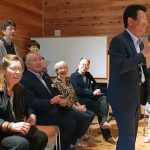 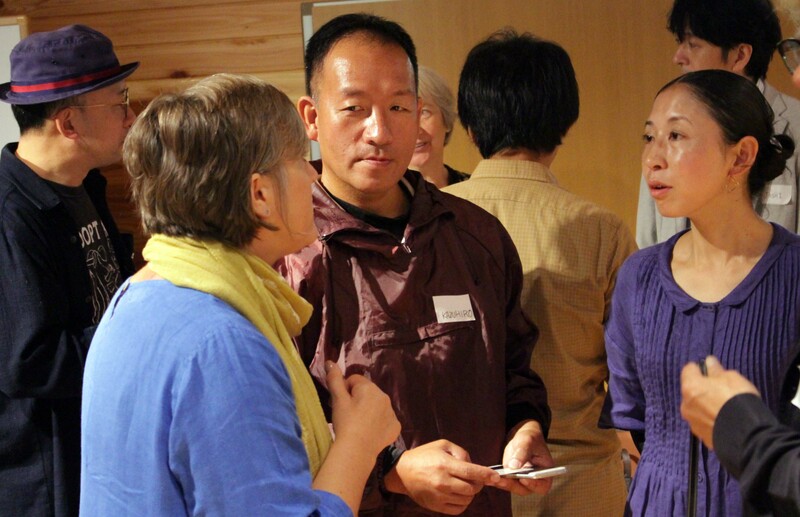 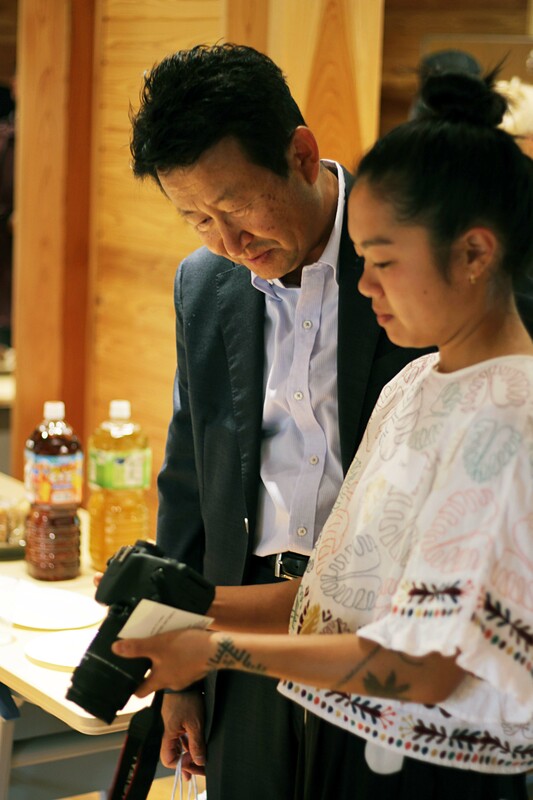 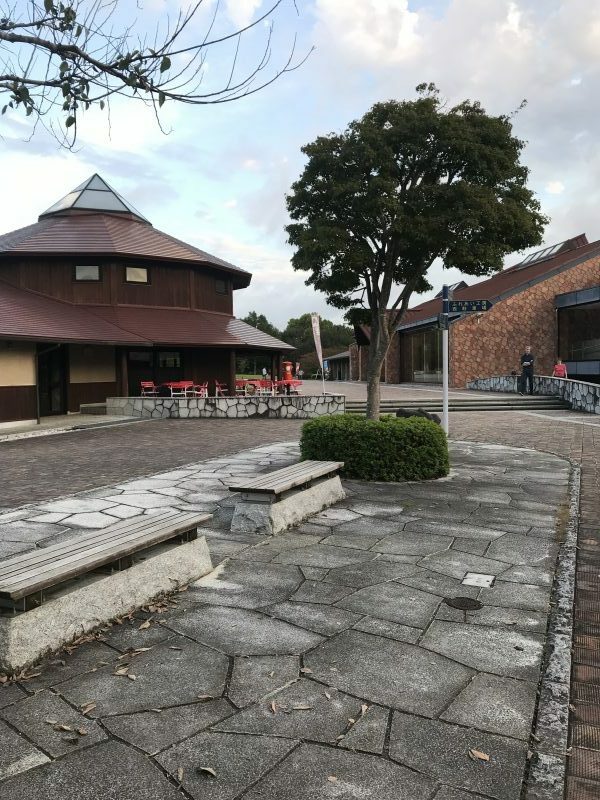 The day started with visit and a reception at the Mashiko Museum of Ceramic Art attended by the Mayor of Mashiko, the directors of the Museum, Ken Matsuzaki, Tomoo Hamada, artist in residence Penny Simpson and students from the local ceramic college. 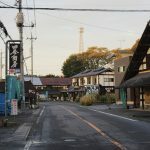 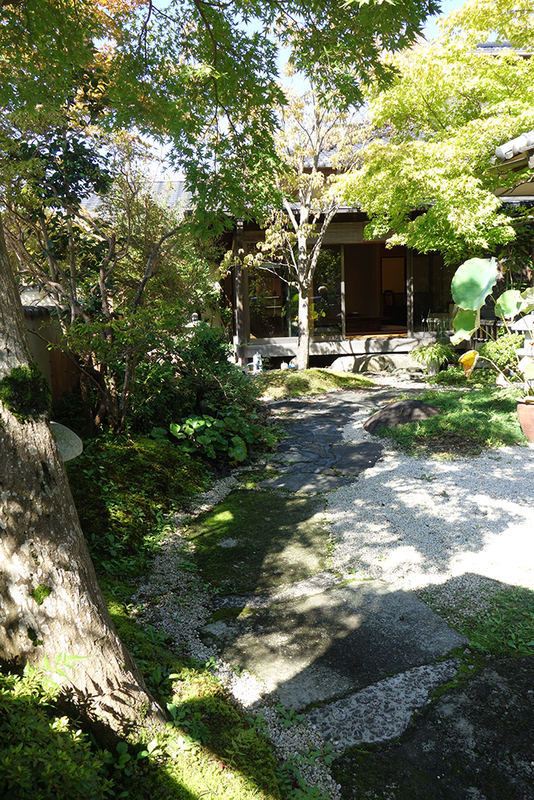 In the afternoon there was a return to the studio at the Mashiko Tougei Club, the base for the week. 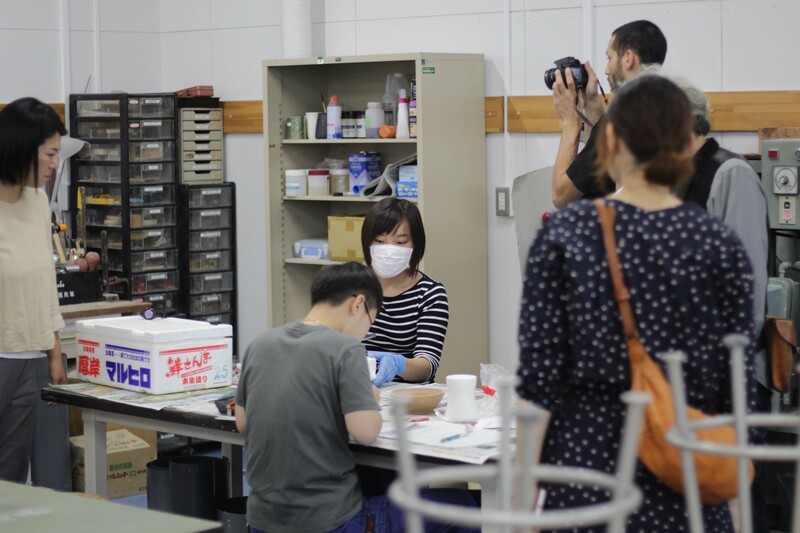 Students were joined in the studio by Ken Matsuzaki, Toshihiko Takeda and Yoshinori Hagiwara who all demonstrated a range of their processes. 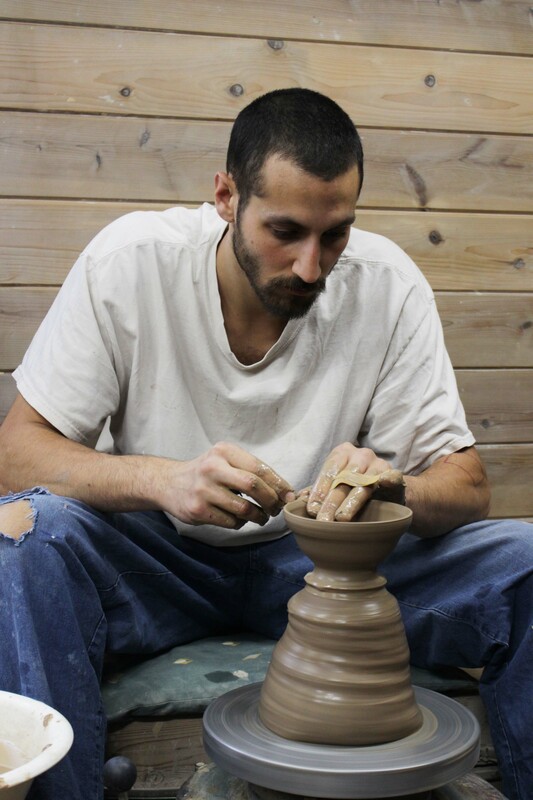 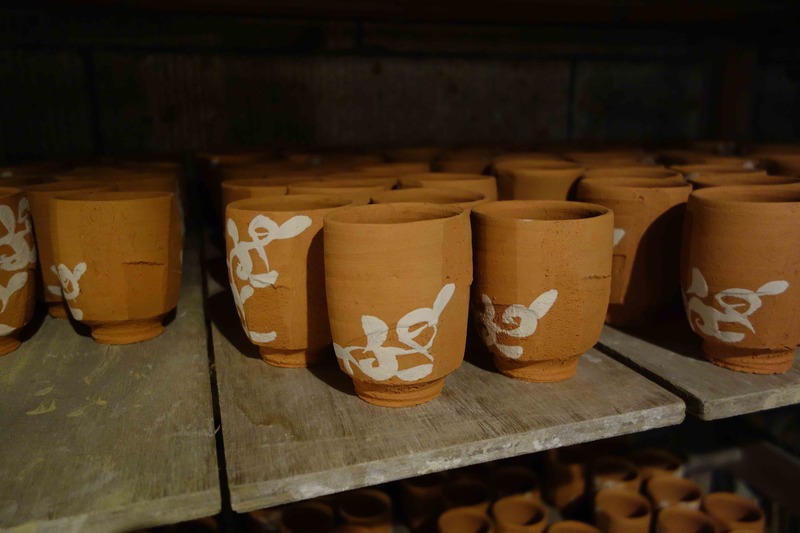 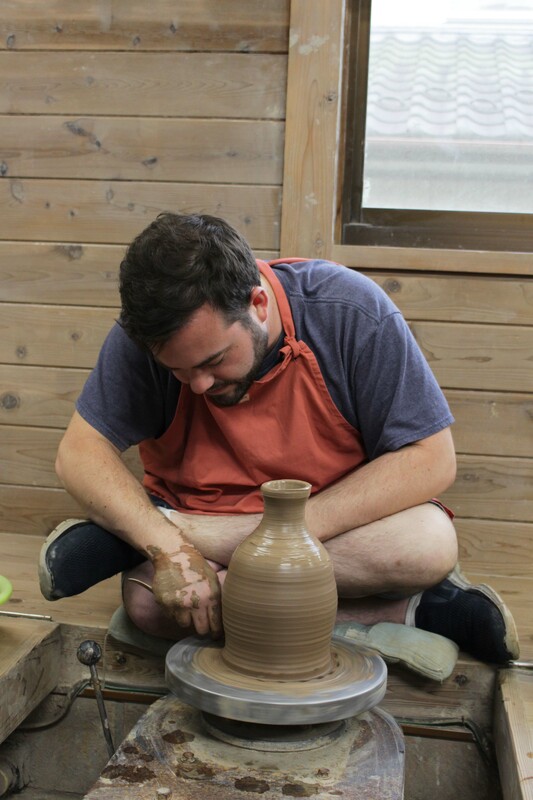 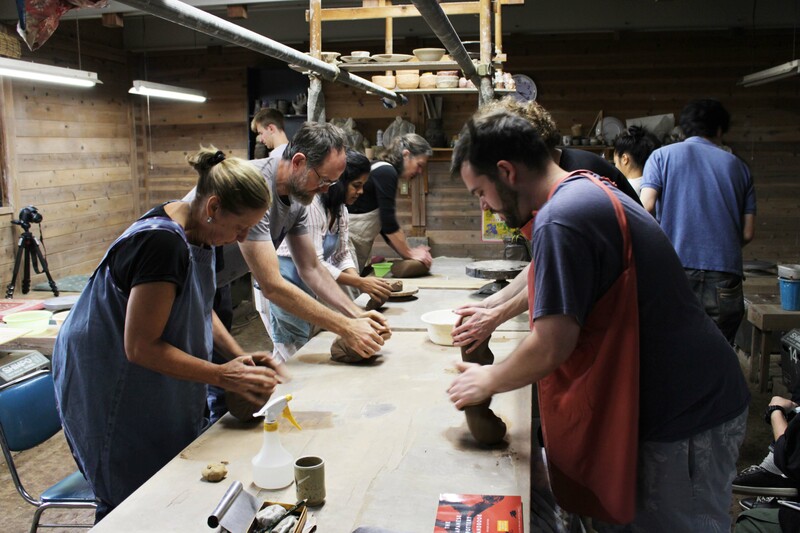 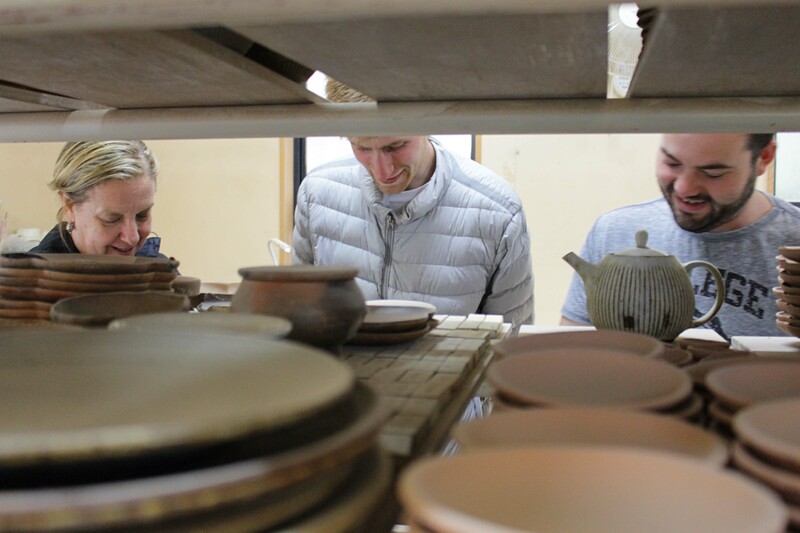 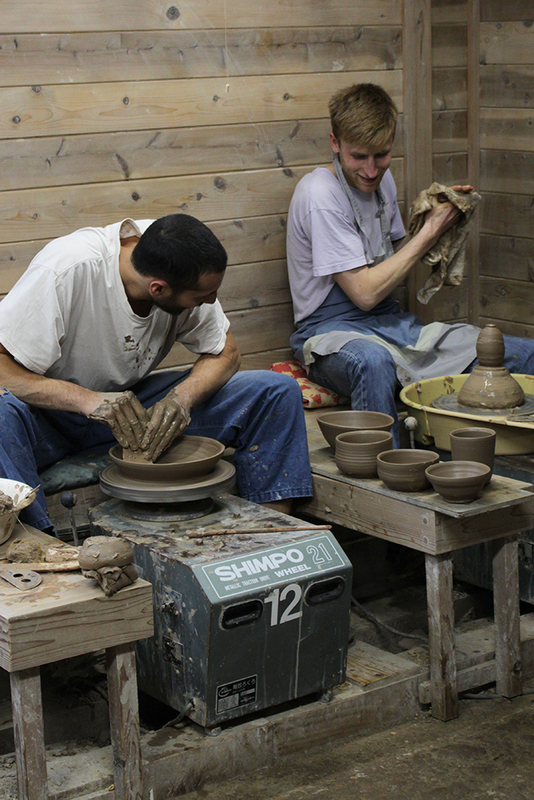 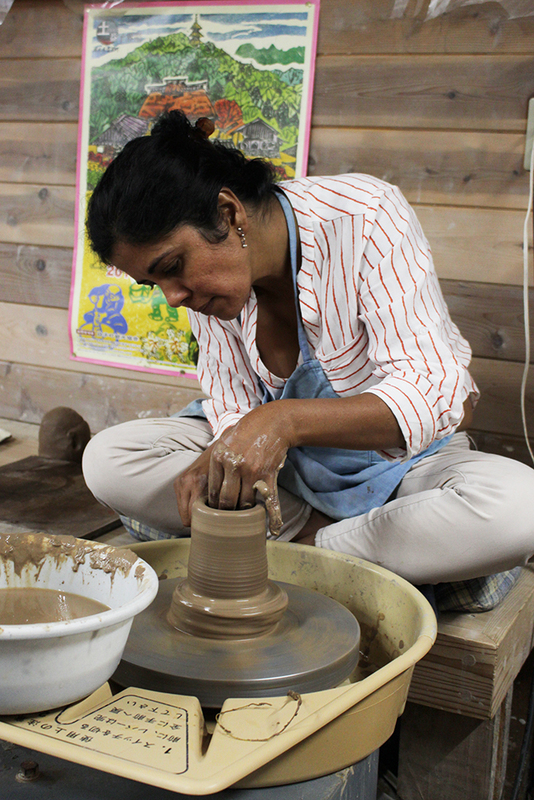 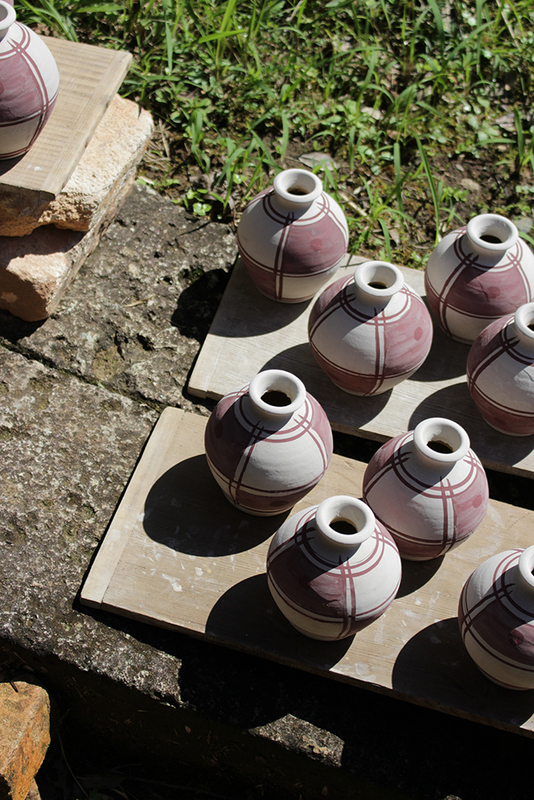 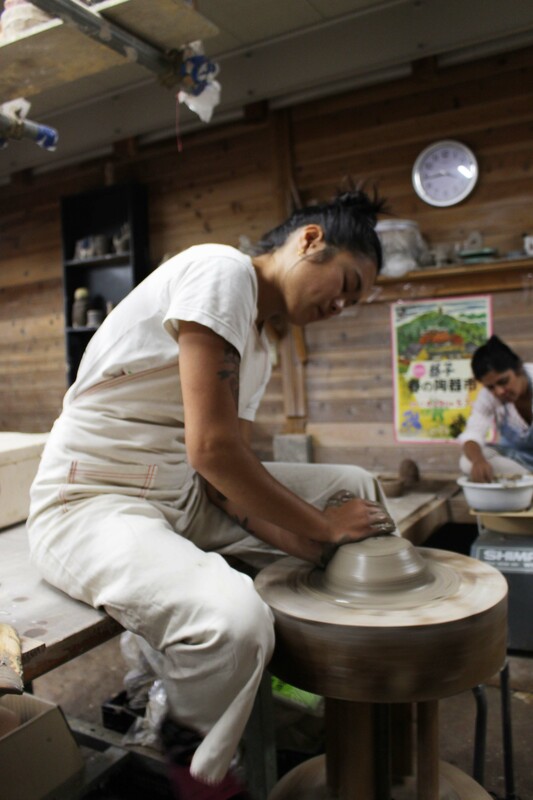 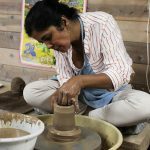 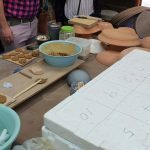 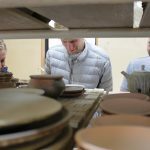 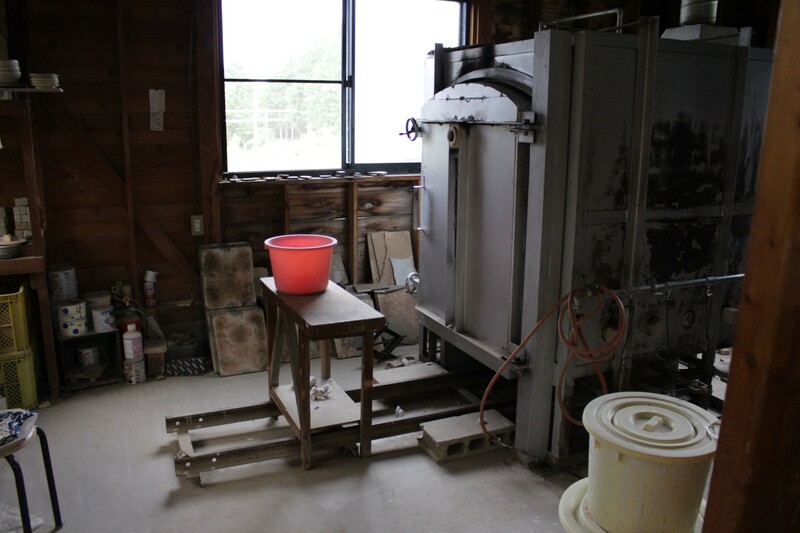 Students were then given the opportunity to work with local Mashiko clay in the studio. 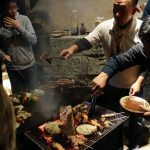 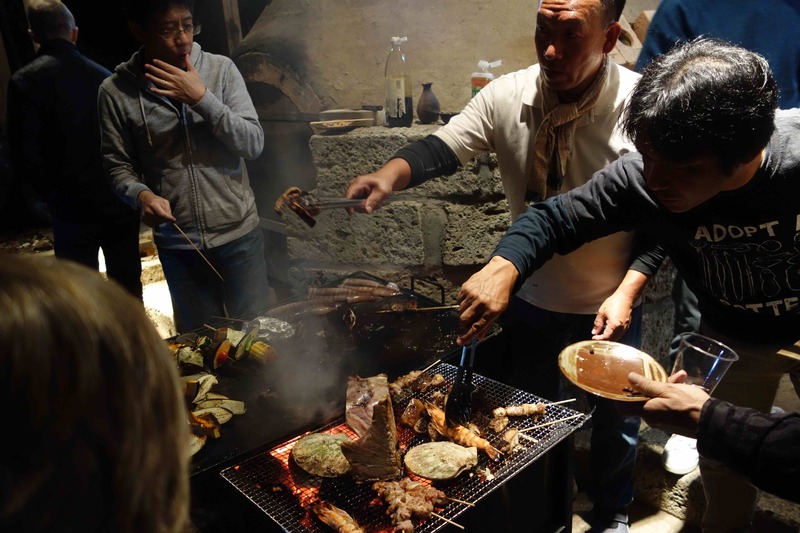 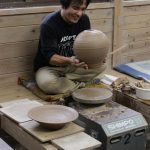 Finally the day ended with a visit to the home, studio and kiln of Ken Matsuzaki where he hosted the most amazing and unforgettable BBQ in front of his anagama kiln. 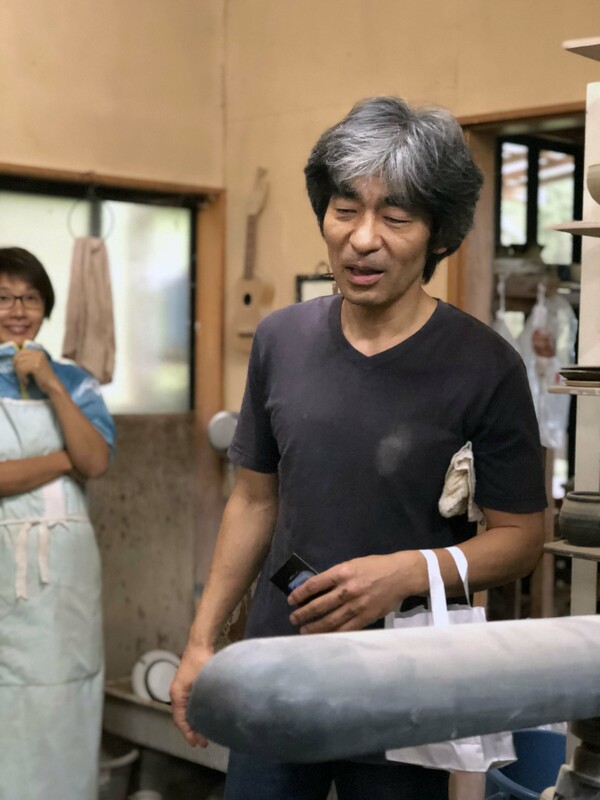 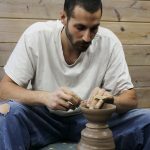 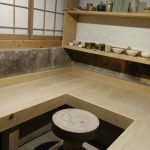 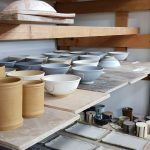 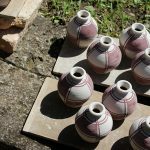 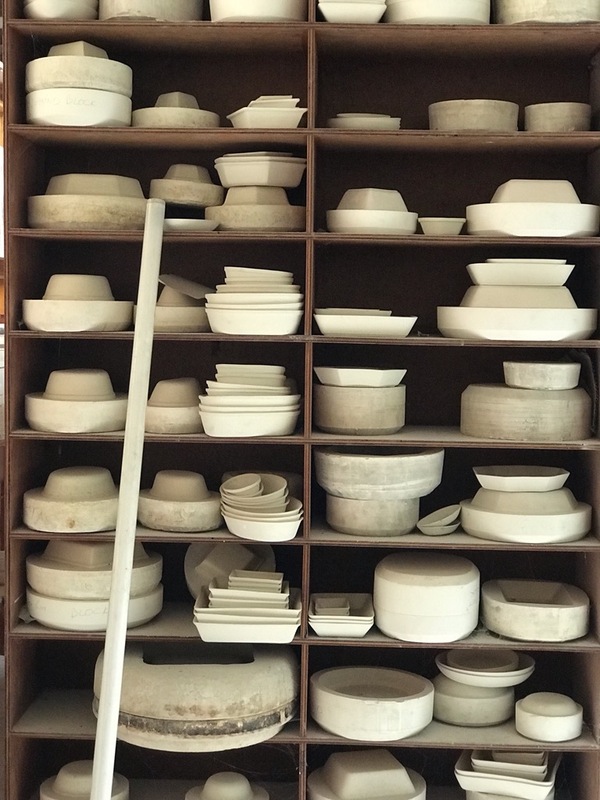 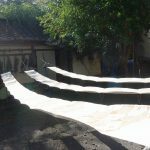 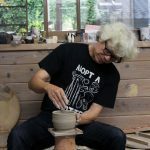 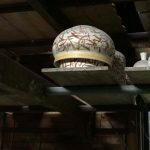 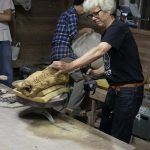 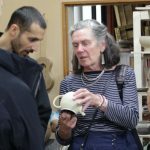 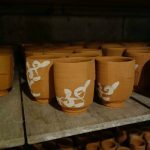 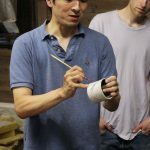 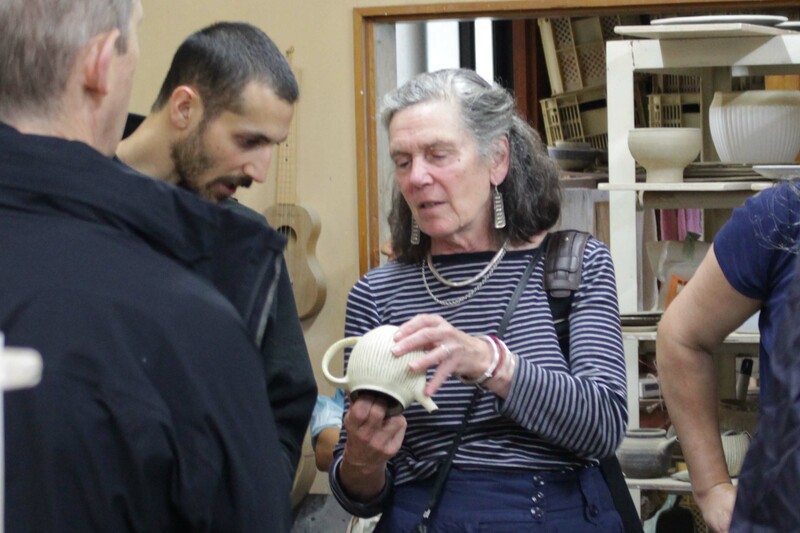 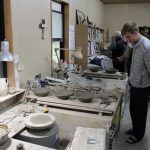 This was an amazing opportunity to visit his studio, see how he prepares for an exhibition, to meet more Mashiko potters and explore his wonderful kilns to understand more about the firing processes he uses. 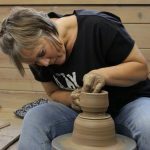 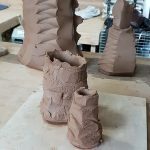 27th September -This brought the opportunity of more time in the studio to work with local clay to explore some of the shapes and forms they had been inspired by so far. 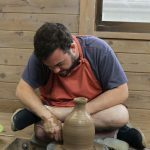 This allowed them to begin working through some of their ideas that would be explored more fully upon their return to England. 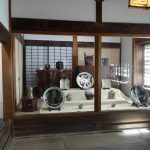 After lunch there was an opportunity to go out to see some of the many galleries and pot shops that Mashiko is famous for. 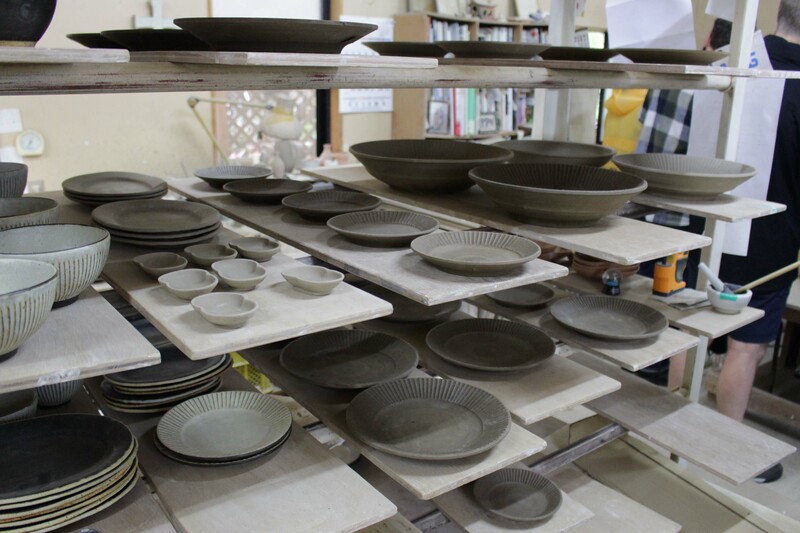 This allowed the students to begin to appreciate the sheer range and diversity of pottery made within Mashiko and surrounding areas. 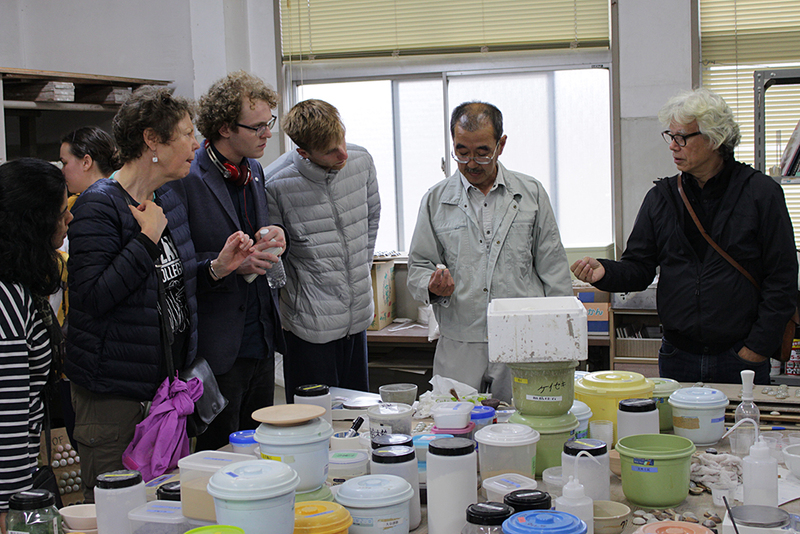 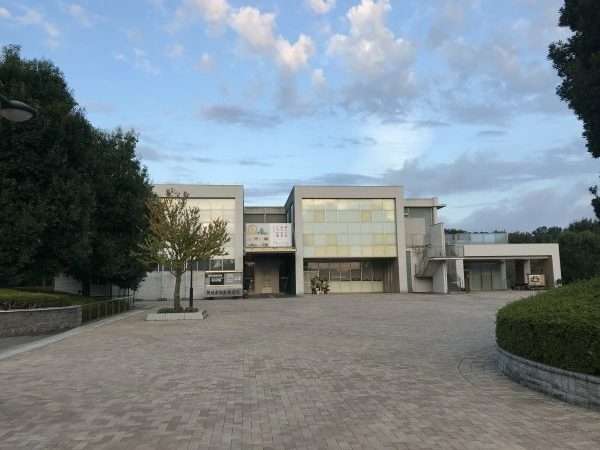 To finish the day students, trustees and staff got to visit the Tochigi Prefecture Ceramics Technology Support Centre, where local potters are trained, to see their facilities and how the potters of the future are trained on this side of the world. 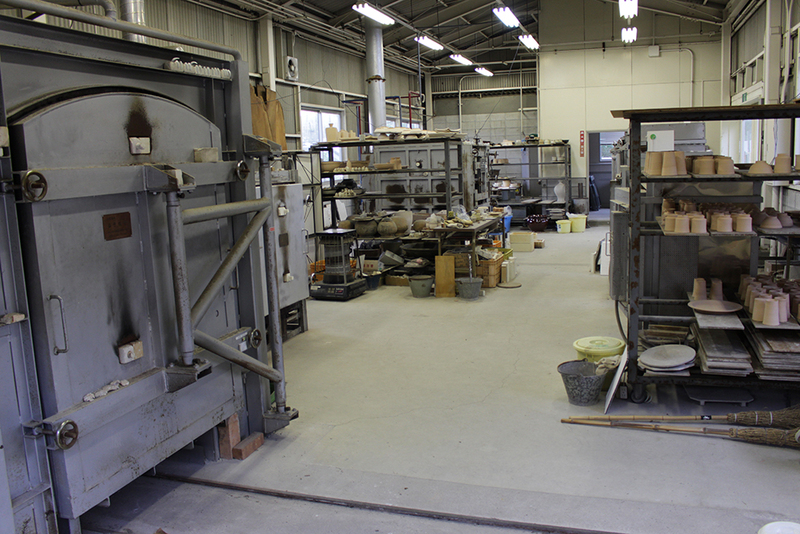 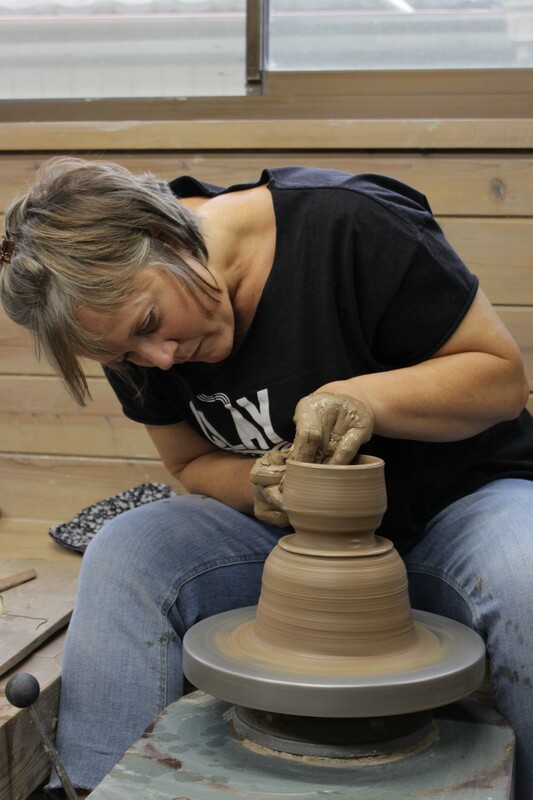 The facilities are also available for the use of local potters, especially specialist equipment. 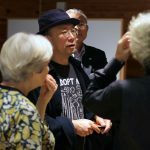 28th September -The final day in Mashiko held a look around the beautiful Kanoya gallery that had an exhibition titled “Stick to the soil” on with by Aku Aku, Yosuke Ono, Yosuke Takeshita, and Ryuji Miyata. 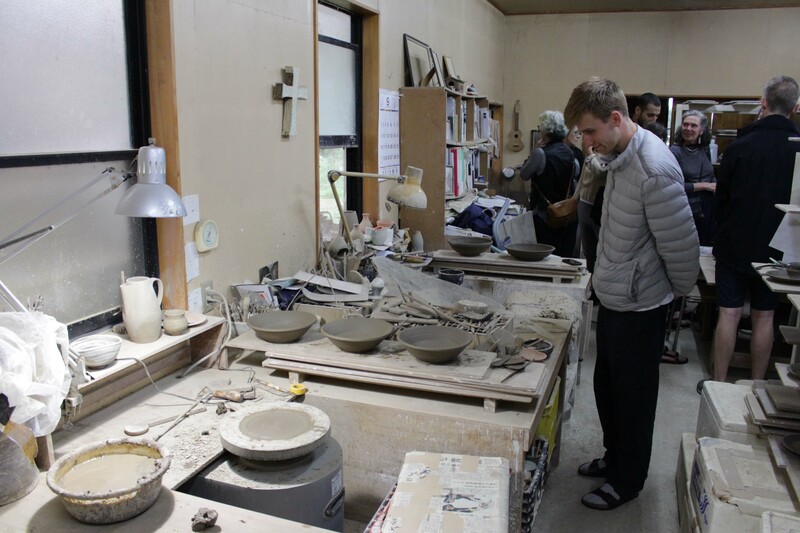 There was also an opportunity to see the work of some of the other potters met in Mashiko. 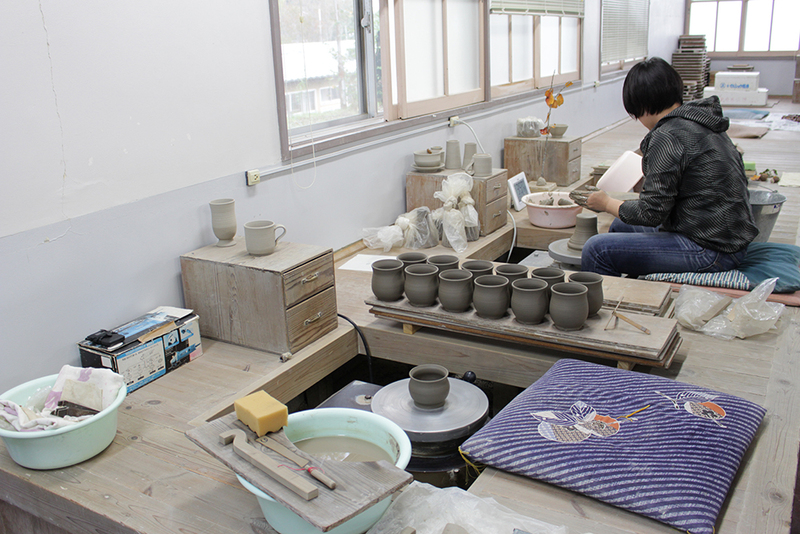 The gallery is where many potters in Mashiko aspire to have their work shown. 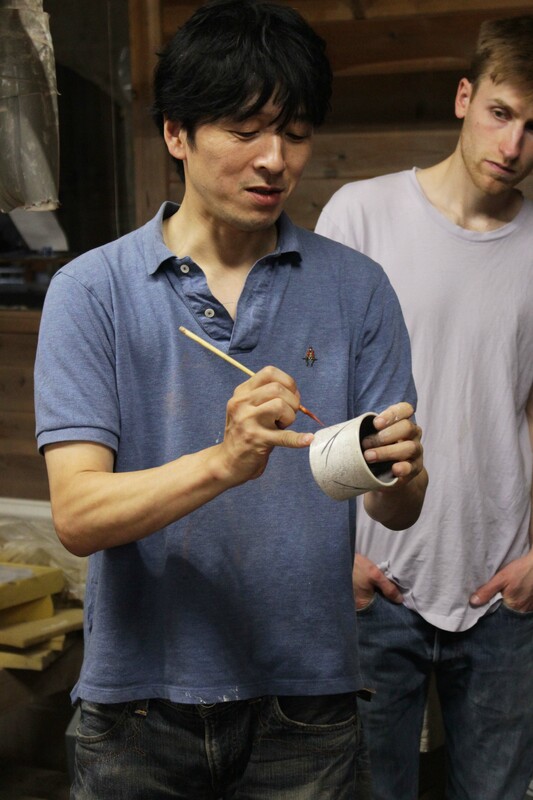 The students had been invited by Tomoo Hamada to see the kiln at the Hamada-gama pottery being packed and work being prepared. 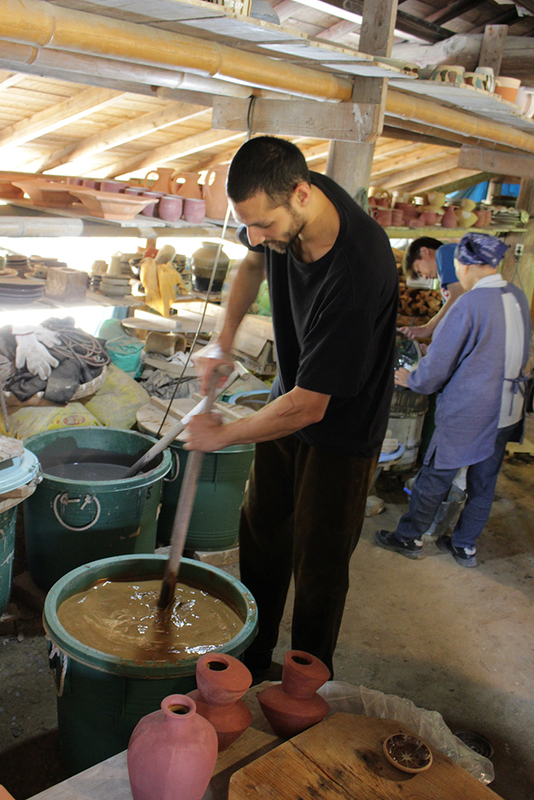 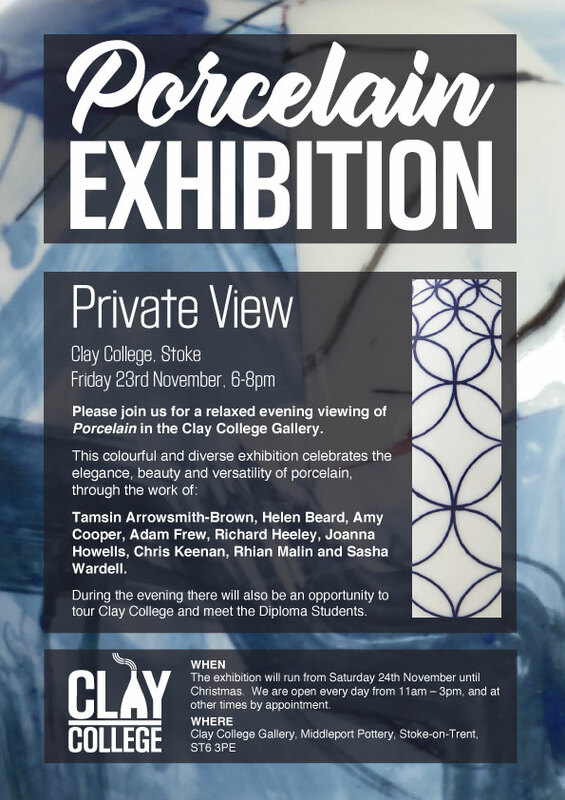 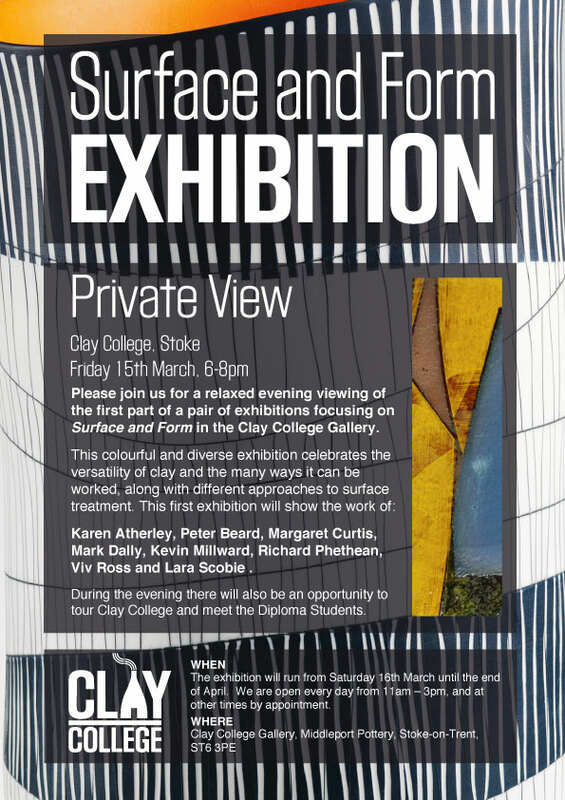 What was most intriguing was one of the glazes being used made from a local clay and the stirring needed to use it. 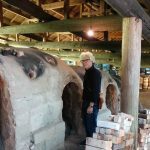 It was also interesting to see how the kiln has no specific chimney the slope draws the smoke and flames then the bank deflects it. 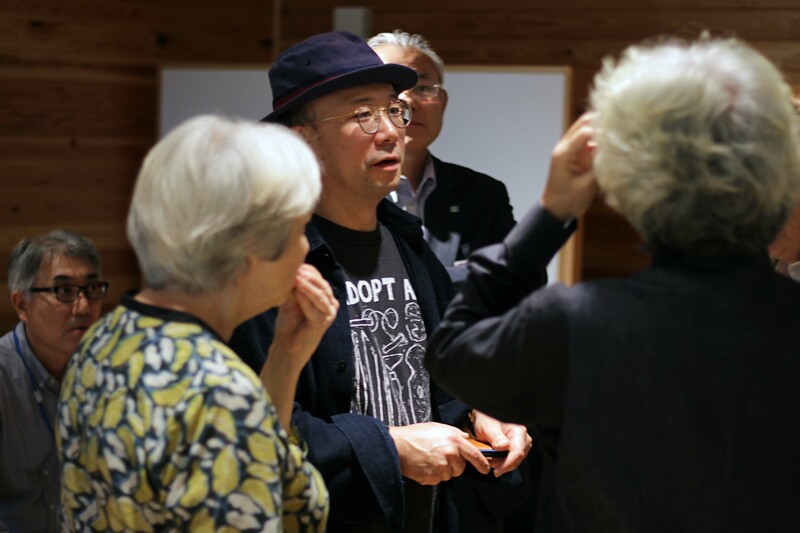 Then there was an opportunity to tour of the Shoji Hamada Memorial Mashiko Sankokan Museum with Ken Matsuzaki. 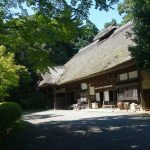 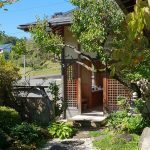 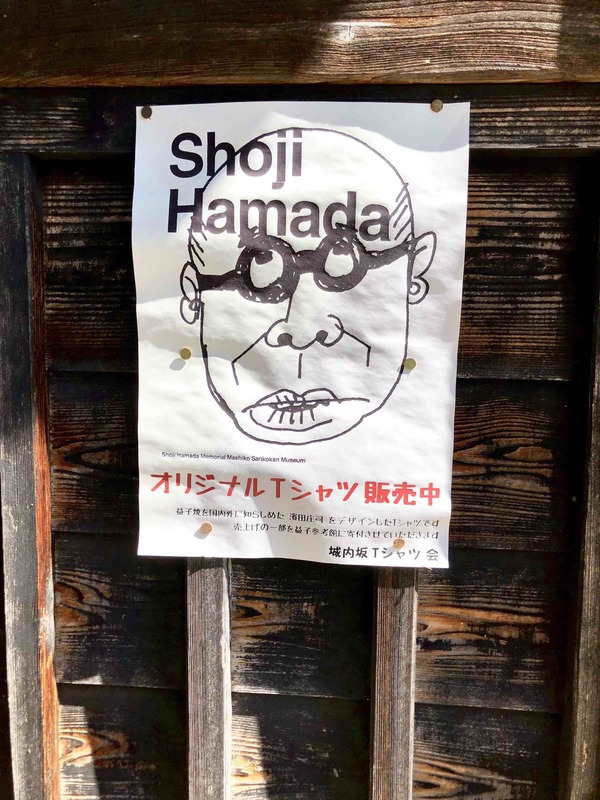 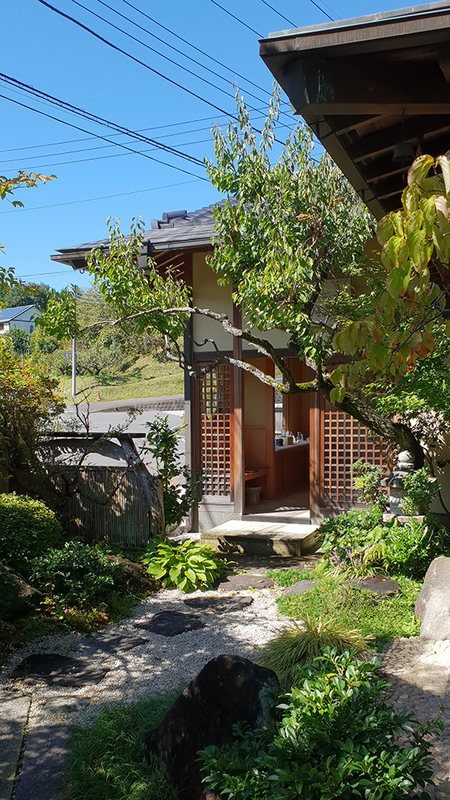 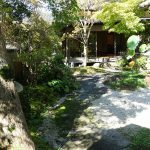 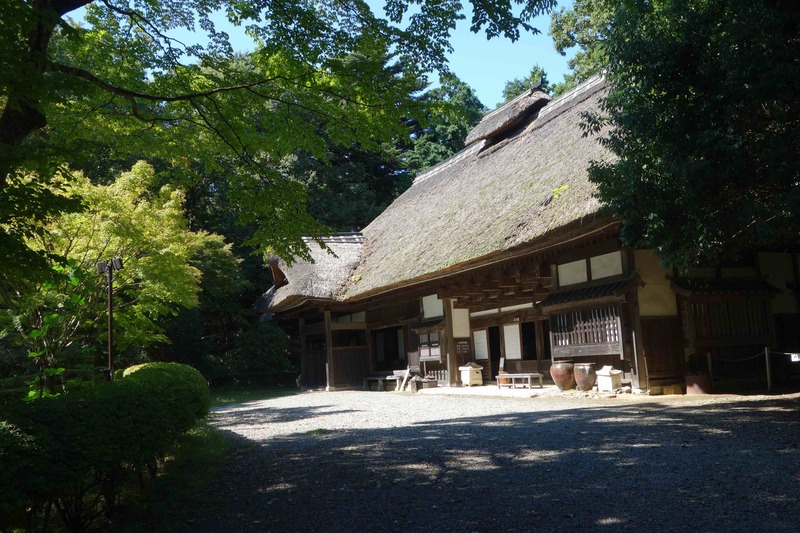 This included Shoji Hamada’s residence and workshop within the beautifully maintained grounds. 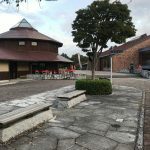 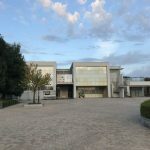 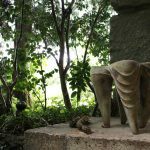 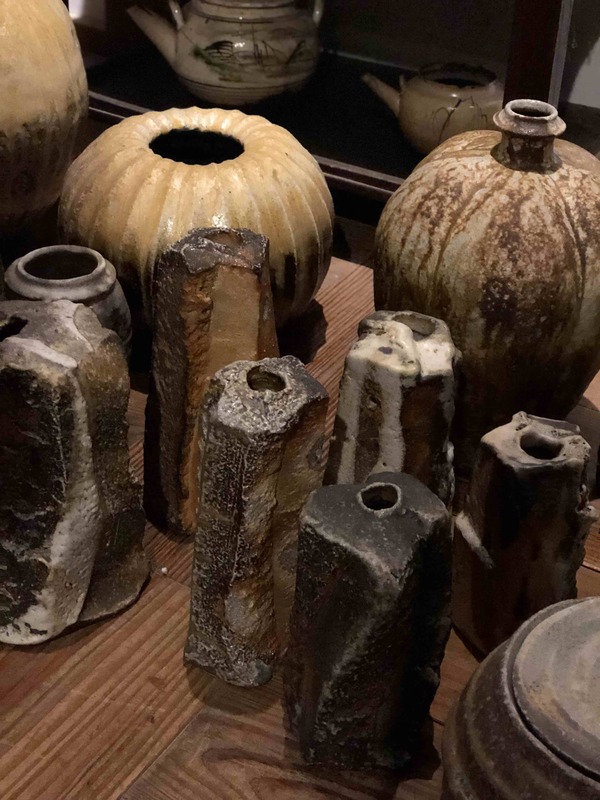 The museum also houses his collection of pottery, artefacts and art from around the world that he drew upon for inspiration within his own work. 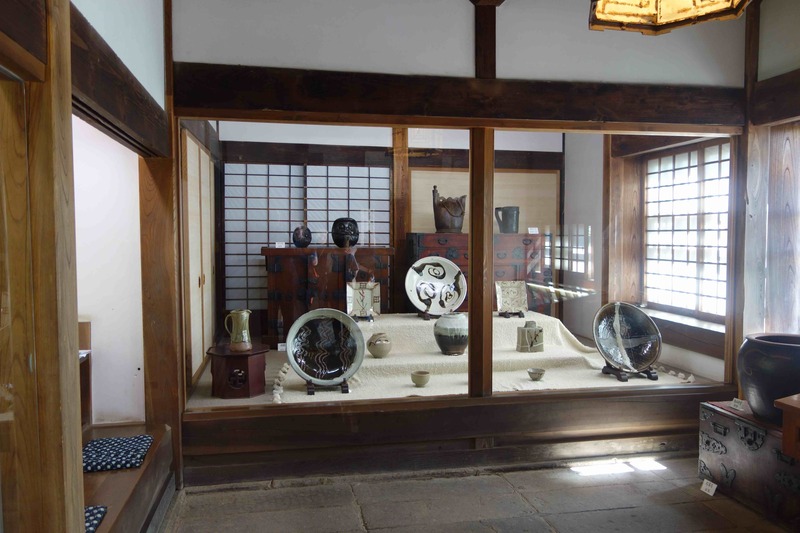 This includes pieces from around the work and potters like Kawaijiro Kawai and Bernard Leach. 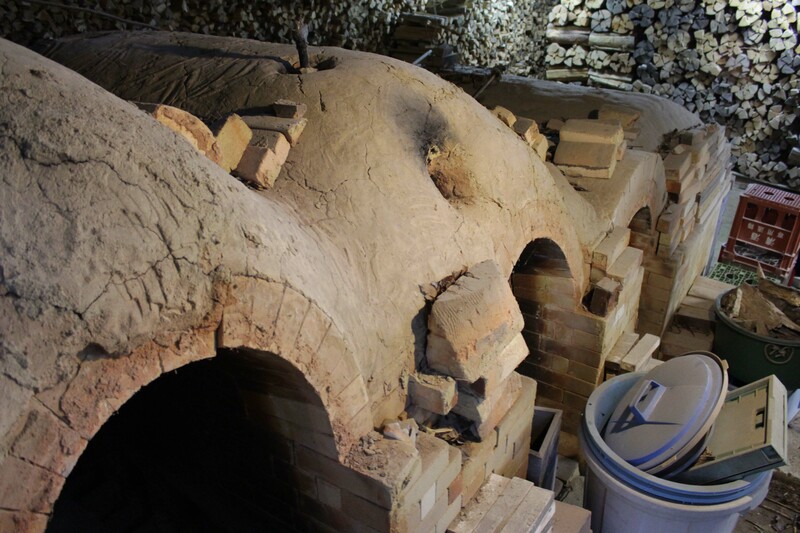 Within the grounds of the Museum there are also a number of kilns, most notably the climbing kiln. 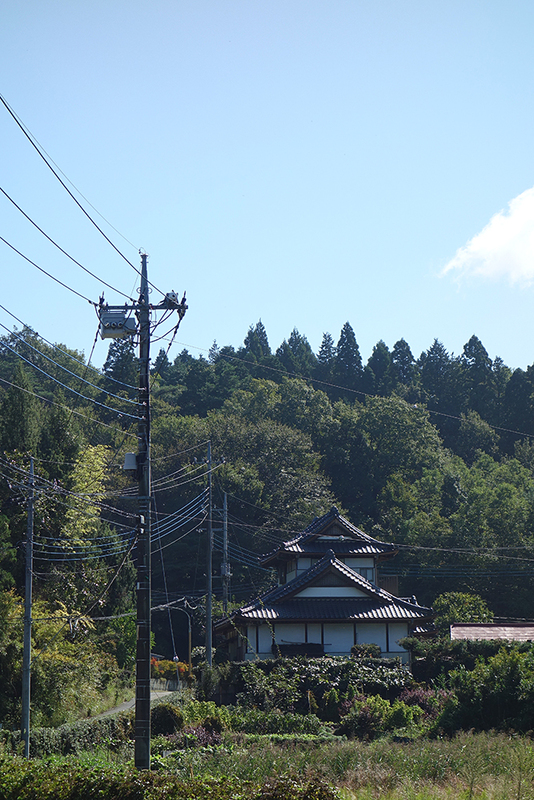 This was damaged during the 2011 earthquake. 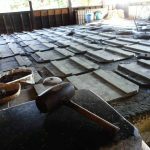 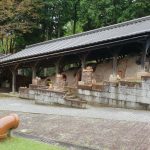 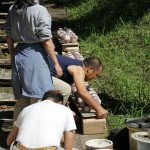 During the visit Ken Matsuzaki explained how many potters from Mashiko had come together and through the communal efforts of the climbing kiln project it had been restored and fired. 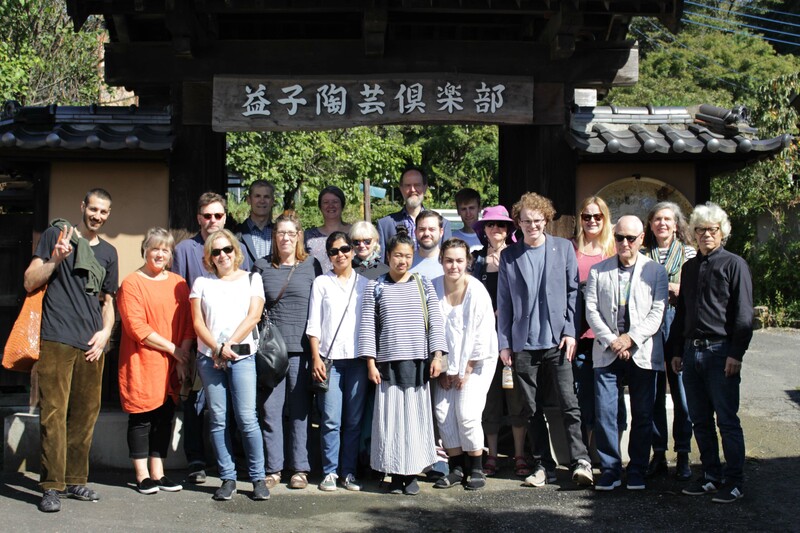 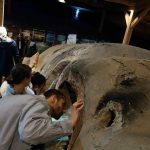 The visit to Mashiko was a truly unique opportunity for the students. 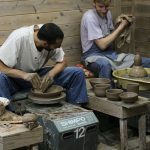 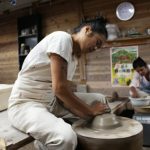 It exposed them to a side of pottery they had not experienced before and they had their eyes opened to what a diverse range of handmade pottery is available and the breadth of techniques used to create it. 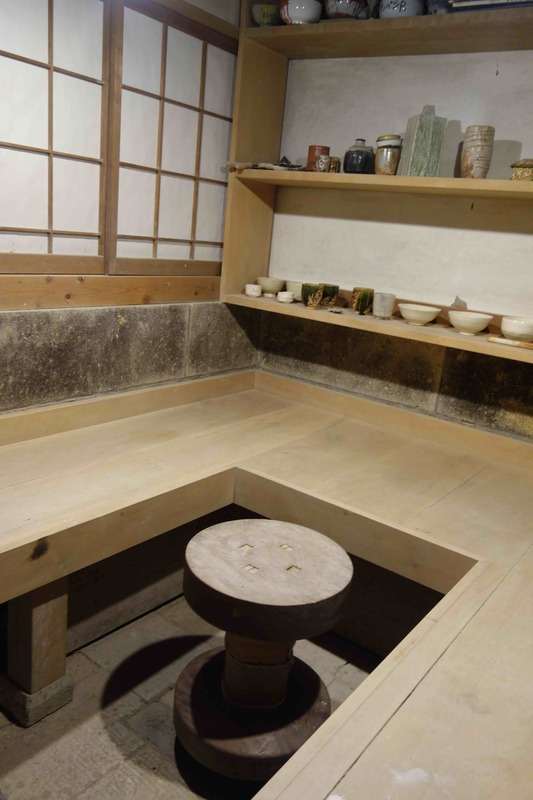 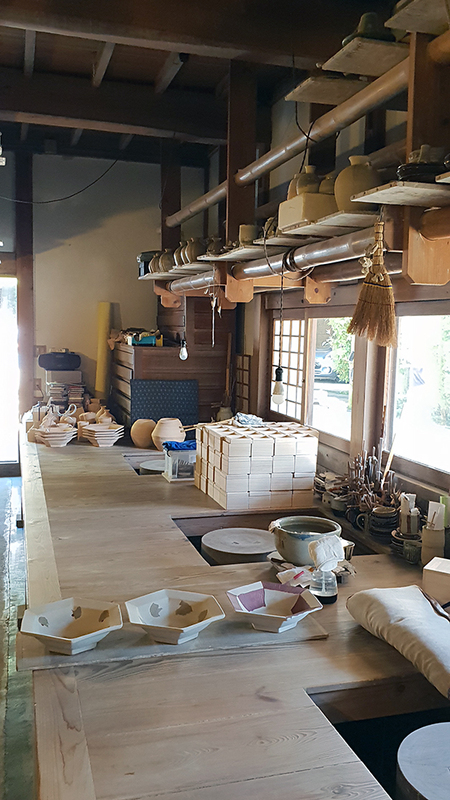 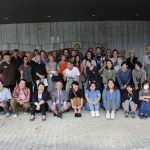 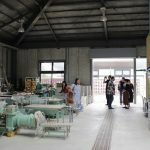 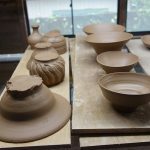 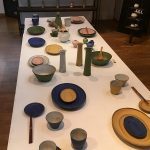 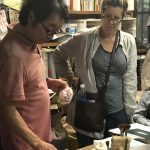 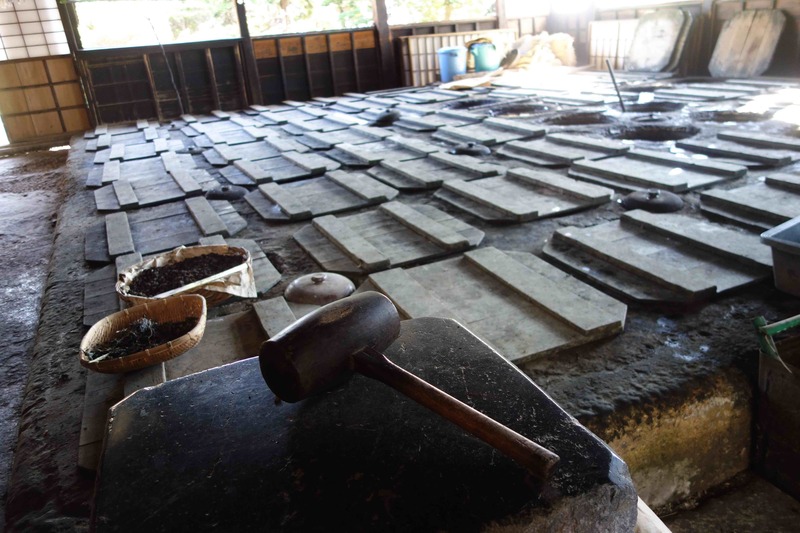 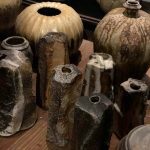 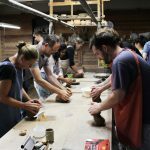 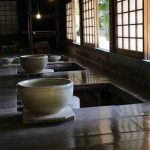 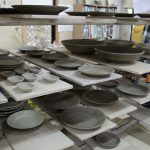 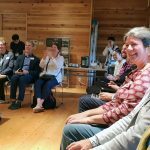 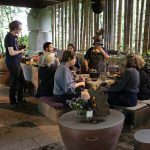 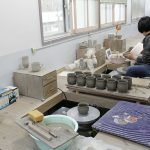 They also had the opportunity to see sites and were welcomed ‘behind the scenes’ by potters to see kilns and work in raw states, this would not have been able to happen without the generosity of Ken Matsuzaki and the potters of Mashiko.